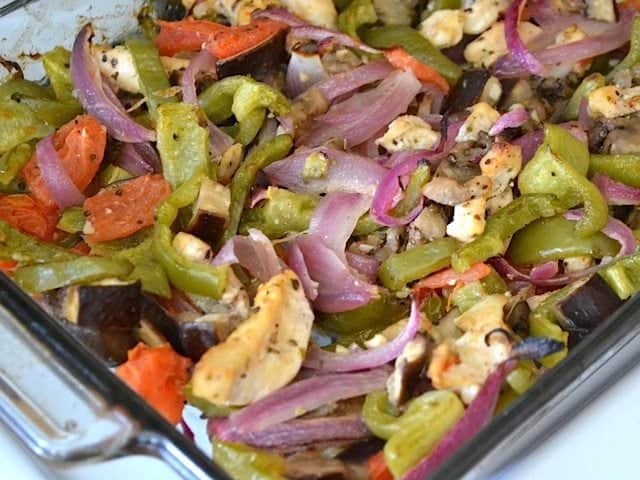 One of my all-time favorite recipes is Oven Fajitas. 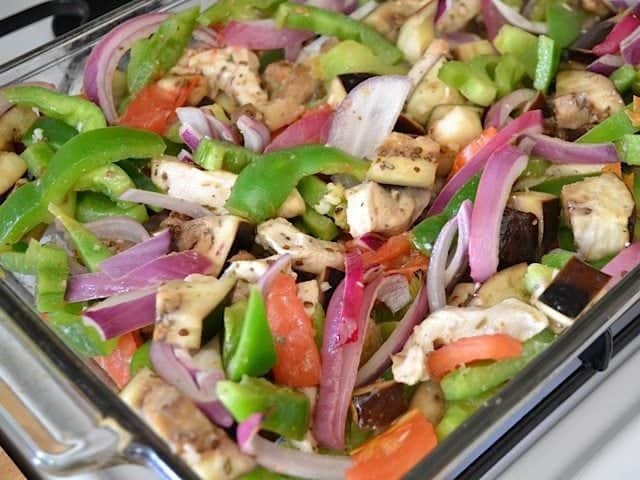 It’s easy, flavorful, and healthy. So, I decided to try the same concept with different flavors. 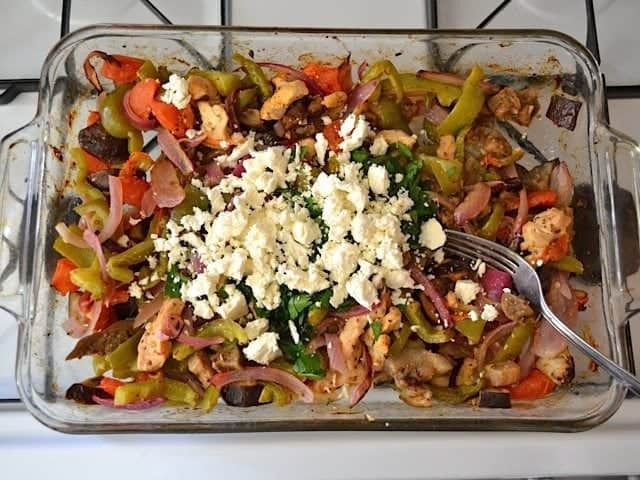 For this version, I chose Greek inspired vegetables (bell pepper, eggplant, tomato, and red onion), drenched them in a lemon-garlic marinade, then topped the whole thing with feta and fresh parsley after roasting. I added one thinly sliced chicken breast for a little belly-filling power, but this could easily be made vegetarian (add mushrooms, asparagus, or artichokes maybe?). I set the serving size to a half-round pita pocket. Each one of those servings came out to just $1.37, but even if I was so hungry that I ate two (which may or may not have happened…) it’s still less than $3! Win! 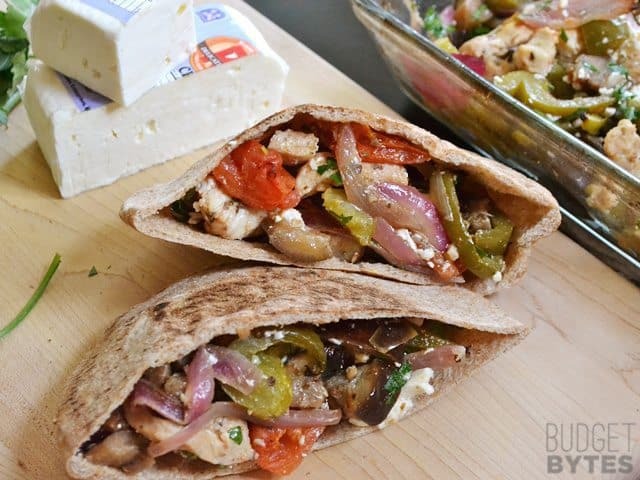 These Oven Roasted Greek Stuffed Pitas are an easy make ahead lunch with big flavor and little effort. Preheat the oven to 400 degrees. Slice the red onion and bell pepper. 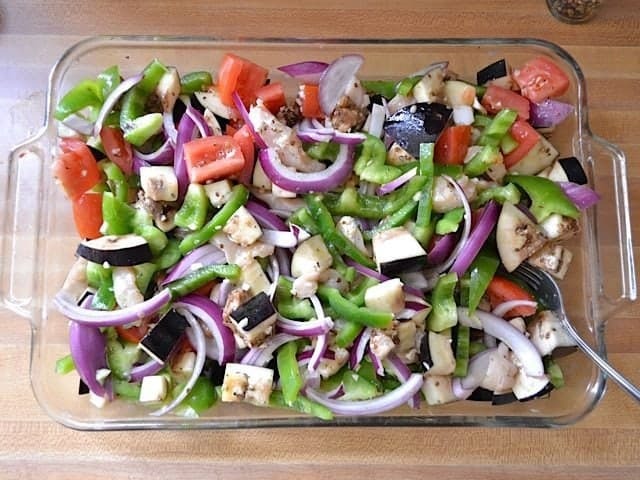 Cut the eggplant and tomatoes into one-inch chunks. 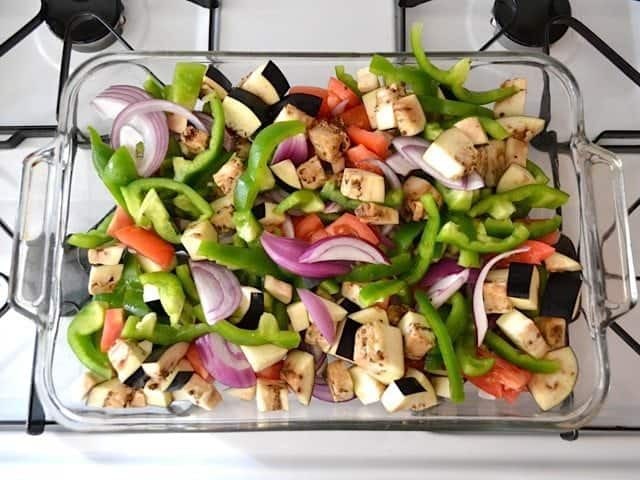 Place the red onion, bell pepper, eggplant, and tomatoes into a large 9x13 inch casserole dish. Slice the chicken into very thin strips and then add to the casserole dish with the vegetables. 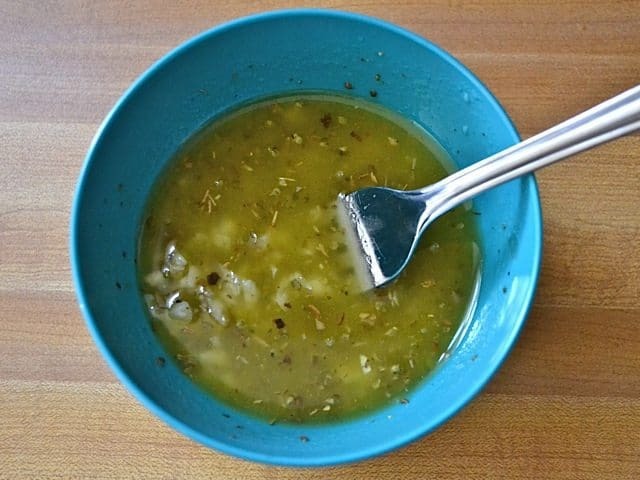 Mince the garlic and add it to a small bowl along with the olive oil, lemon juice, oregano, salt, and a generous helping of freshly cracked pepper (20-30 cranks of a pepper mill). Stir to combine then pour over the chicken and vegetables. Toss until everything is well coated in the dressing. Roast the chicken and vegetables in the preheated oven for 60 minutes, stirring once every 20 minutes. After roasting, top with crumbled feta and roughly chopped fresh parsley. 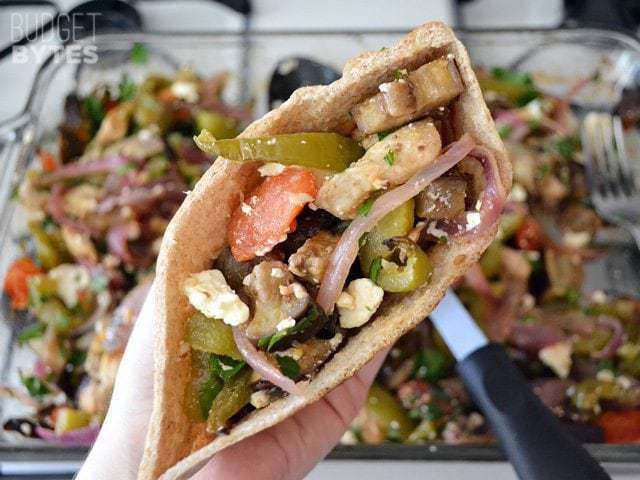 Stuff the mixture into the pita pockets and enjoy warm. **I buy my chicken breast when they're on sale and save them in my freezer for later. I know, I know… there are four tomatoes in the picture. I intended to use four, but quickly realized that would be WAY too much, so I only used two. 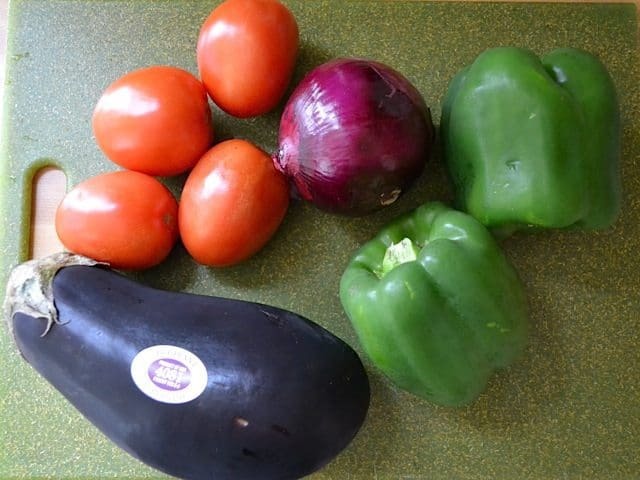 I also used one red onion, two green bell peppers, and one eggplant. I sliced the onion and bell pepper into strips, and the tomato and eggplant into one-inch cubes. Place them all into a large 9×13 inch casserole dish. Oh yes, start preheating the oven to 400 degrees. It needs to be HOT. 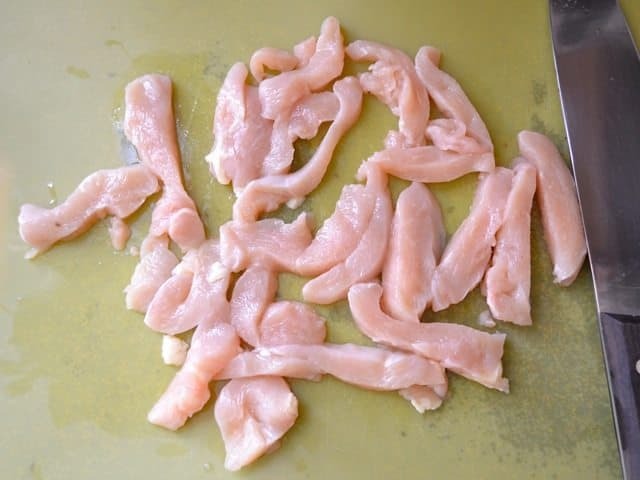 Slice the chicken breast into very thin strips. Remember, the smaller the pieces, the more pieces you’ll have, and the more chicken will be in every bite (instead of one big piece every now and then). And yes, my price for chicken is extremely good. I only buy chicken breast when they’re on sale (usually for about $2/lb) and freeze it for later. Mince the garlic and stir it together with the olive oil, lemon juice, oregano, salt, and a bunch of freshly cracked pepper. Red wine vinegar would also be super good in this if you don’t have lemon juice. Give everything a good stir after 20 minutes to redistribute the juices and help some of the moisture evaporate off, then put it back in the oven. And then after a total of 60 minutes you’ve got some nice brown roasting action. Yummm…. Let it sit for just a minute as you roughly chop some parsley and crumble the feta cheese. Add it to the meat and vegetables and then give it quick stir. And now it’s ready to stuff into pitas and devour! Made this for dinner after I found eggplant in the sale section of Kroger (99 cents in bag with 2 organic cucumbers!!)! I added some yellow squash that was also on the sale rack! I only needed about 40 minutes to cook the chicken through. Severed with a side of yogurt/cucumber/lemon/garlic dip and cous cous mixed with feta/pecans. Fed 3 adults and had plenty left over for 3 more lunches! This is going in my regular meal rotation! I made this tonight, using zucchini instead of eggplant and chickpeas instead of chicken. It was a hit! Delicious! Thinly sliced chicken breast cooked at 400 degrees for one hour is a recipe for jerky. I toss the chicken in a little of the dressing and add for the last 20 minutes. This has become a staple for me. I never get tired of it. I tend to load it up with so many veggies, that I have to double the marinade. 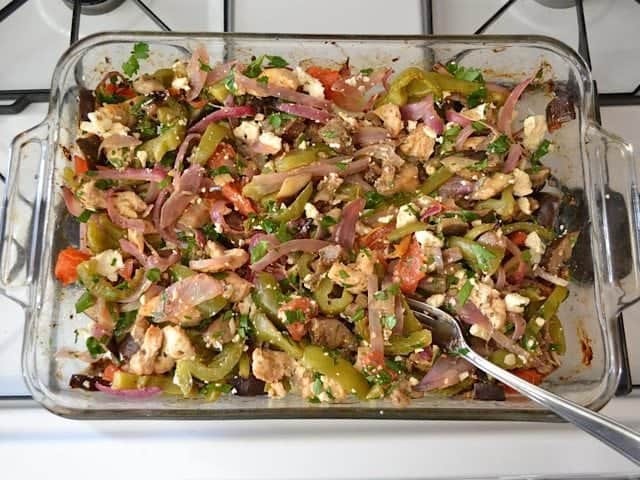 So far my favorite version is with lots of eggplant, bell peppers, tomatoes, onion, chickpeas, mushrooms, artichoke hearts and a generous portion of Feta. 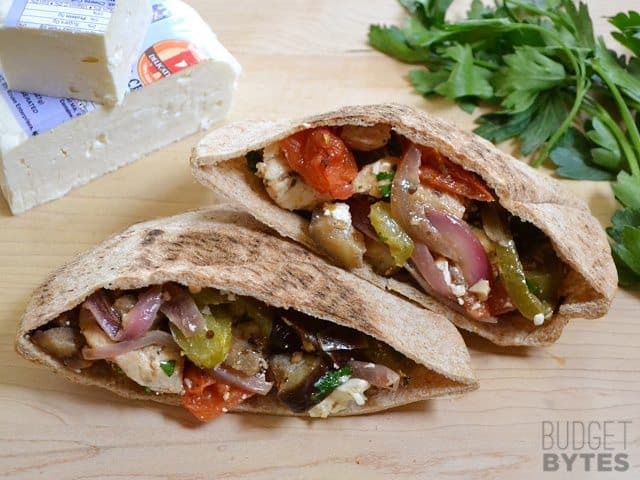 I never have luck keeping pita from falling apart, so I usually make it with brown rice. I’ve also tried it with pasta and it’s yummy warm or cold. I’ve just made this for some of this weeks lunches since I had all the ingredients with the exception of the eggplant which I subbed with some zucchini I had. I also added some dill in the marinade, which I happened to have around. Let me tell you that this kinda blew my mind on how good it is. So simple, so outrageously delicious. Thank you for this – it will definitely become a routine recipe in my kitchen. It probably won’t be nearly as good after reheating from frozen. The vegetables will soften more and probably get a bit soggy. I made this tonight for dinner along with the Lemony couscous minus the cucumber. We didn’t have any pita so we put these roasted veggies on top of the couscous and it was excellent. Thanks again for another hit. I made these for dinner last night and served with the Tzatziki Sauce. I substituted zucchini for the eggplant since I already had those and needed to use them up. I loved the pitas; my family wasn’t so impressed. 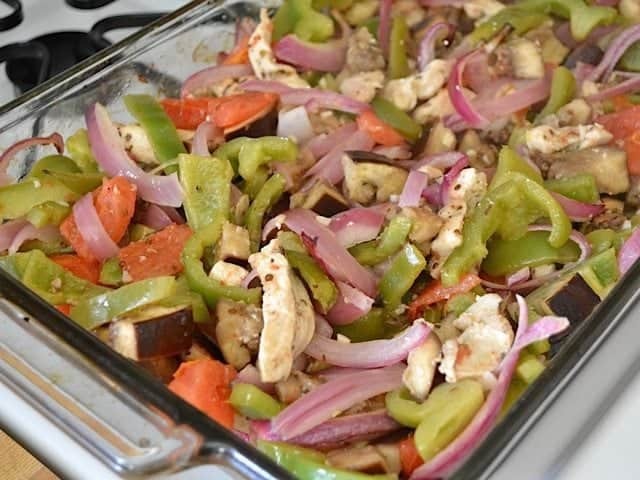 This was a tasty recipe and I especially liked the eggplant. I used sweet yellow peppers because I don’t like the green. I put all the veggies on a baking sheet pan with the dressing and roasted them for about 15 minutes, then added the chicken and cooked for another 15 and it was done. I also added a little fresh oregano at the end. Very yummy! Do you think this would work in the crock pot? Trying to convert or use recipes that don’t use the oven for long since it’s too hot in Texas! I don’t think I’d suggest doing this one in the crock pot because I think it would get too soft and mushy. So good. 9.5/10. I did one batch of the marinade for the veggies and a second batch for the chicken. Make sure to add extra seasonings ( I used cavenders greek seasoning and Lawrys Garlic salt) throughout the cooking process. Turns out really liquidy, so strain out the liquid and put it under the broiler for about 10 minutes after its done cooking and its perfect. Ate with whole wheat pitas and hummus! Going to try it with tzatziki sauce next time! If I were to do this with lamb, do you know what kind of cut I should get? To the person who asked about lamb.. I’ve bought lamb stew cubes like beef.. I would try that!! Just brown it before you mixing it in so it looks better and stays juicier! :) bet it would be absolutely delish! We love this recipe, and I’ve even tried my hand at tzatziki sauce, and it was a nice touch, too! I’m wondering if anyone has tried this with thinly sliced beef? I’m thinking if trying that for supper tonight. I made it with beef today, and it was GREAT if I do say so myself! A new favorite! So amazing!!!!! I added some baby portobellos and Penzys Greek seasoning. Served with whole wheat pita and hummus. Hubby was moaning in delight all through dinner. Thank you!